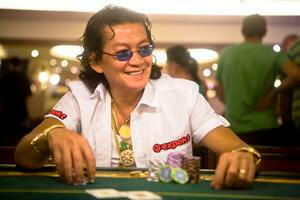 On the Bluff Magazine website there is an interview with Scotty Nguyen where he discusses the Poker Hall of Fame. Scotty talks about why he deserves poker’s biggest honor and touches on what everybody knows is keeping him out of the Poker Hall of Fame; his actions at the 2008 WSOP $50k HORSE tournament. As the Bluff Magazine piece states, it has been four years since that incident, and I agree with Scotty that he is a surefire Hall of Famer at some point, and “You know baby, if they hold on to that, a mistake I made in 2008, then everybody’s a criminal.” But the thing is, if poker wants to move out of the shadows, and continue to build upon the legacy that began in 2003, incidents like this need to be eradicated, and unfortunately that means Scotty Nguyen is going to have to be the fall-guy. Like the NFL the poker world needs to eliminate bad behavior by setting examples, and what could be a more costly example than having your Hall of Fame induction pushed back half a decade (my feeling is that Scotty should get snubbed again this year and next and then inducted in 2014), not to mention the loss of endorsement deals the 2008 incident likely cost Scotty. In a way I feel bad for Scotty, as his public image (in the TV Poker era) is pretty much a fun-loving poker pro who is always smiling, and the 2008 HORSE tournament was definitely a one-off incident, BUT that one-off incident cannot go unpunished considering poker is notorious for copycat youngsters who learn their cues from what the pros do. If Scotty doesn’t get punished, and punished hard, then it sends the wrong message to young players. Sure, there are other poker pros who act just as poorly, but they are either inconsequential players in the game, or it’s a part of their reputation (Hellmuth, Matusow, Tony G) and is actually expected of them. It’s similar to being the heel in professional wrestling; we expect them to smash a guy with a chair when the refs back is turned or to conceal a weapon of some sort, but when a hero does this it’s just different and changes the way we look at them. This is what happened to Scotty in a single hour of televised poker; the way the poker world viewed him changed, and his apology tour is going to have to continue for the time being. Fortunately, in the end Scotty will be vindicated, and even though most people have forgiven him for that momentary lapse of control, he still needs to finish out his punishment – 2014 Scotty, that’s my guess for your HOF induction.